A clever caper movie, The Usual Suspects is certainly engaging but ultimately a bit too clever for it's own good. A solid cast enjoys a combination of energetic verbal sparring and old-fashioned heist action infused with more modern blood and violence, but an excess of criminal characters all attempting to outsmart one another causes an imbalance that threatens to overwhelm the movie. A lot of bad people are lying dead in and around a ship at the San Pedro Harbour in Los Angeles, victims of a full-blown shoot-out between rival gangs. One of only two survivors is Roger Kint (Kevin Spacey), known as Verbal, a small time hood with a pronounced limp, who has survived the carnage without a scratch. US Customs and FBI Agents, including Special Agent Kujan (Chazz Palminteri) round on Verbal, interrogating him to unravel why so many criminals met their bullet-perforated fate at the waterfront. Through flashbacks, Verbal recounts the story of his now-deceased criminal gang colleagues: mastermind and former corrupt cop Keaton (Gabriel Byrne), trigger guy McManus (Stephen Baldwin), the almost incomprehensible Fenster (Benicio del Toro), and Hockney (Kevin Pollack). After the gang forms in a jail cell, Keaton leads them in holding up a corrupt police taxi service in New York, and then, at the request of a mysterious Mr. Kobayashi (Pete Postlethwaithe), robbing a Los Angeles jeweler. Kobayashi then reveals that his employer is the legendary criminal Keyser Soze, and asks Keaton to lead an assault on a boat belonging to a Hungarian gang, who are rivals of Soze in the drug trade. The attack would be dangerous, but the pay-off for Keaton and his men is huge: 91 million dollars. Keaton asks Verbal to sit-out and witness the assault, which goes a bit better than planned, with Keaton and McManus surviving the vicious shoot-out. But a mysterious figure appears from the shadows, eliminates them both and disappears. Kujan needs to decide how much of Verbal's story he can believe, and what to make of some really odd pieces in the convoluted puzzle. 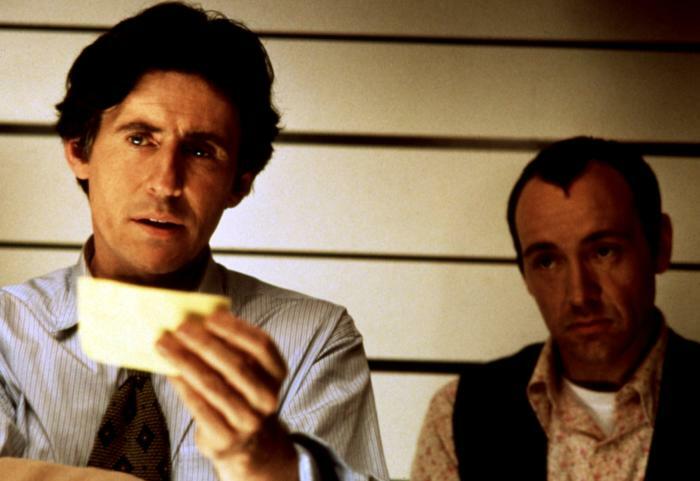 The Usual Suspects climaxes with a double twist ending. but while initially the final revelation appears ingenious, it actually disintegrates under it's own weight: If Keyser Soze is as brilliant and resourceful as the film reveals him to be, he certainly chose a very rudimentary, brute-force method to achieve his ultimate objective. The film is essentially a character study, and while Kevin Spacey and Gabriel Byrne provide Verbal and Keaton with some depth and interesting texture, the rest of the criminals and cops are vaguely sketched by Christopher McQuarrie's script, and quite forgettable. Director Bryan Singer maintains a brisk pace and brings out the tension in the dialogue exchanges and narration that underpin the unfolding plot, and just about maintains control of the increasing layers of complexity. 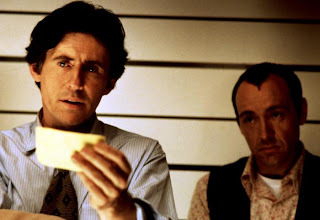 The Usual Suspects is enjoyable, mostly for being a quite unusually intelligent movie, but it does chase itself into a corner where the smarts overpower the logic.